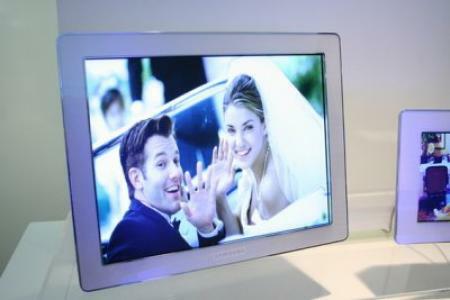 CeBIT 2007: Samsung SPH-72P – the World's most powerful picture frame? Samsung have announced the Samsung SPH-72P, an 800 x 480 pixel photo frame. Long known for their cries of “the world’s most…”, the SPH-72P could let Samsung claim they have the “world’s most powerful photo frame”. Why? Well, not only does it come with Wi-Fi to stream your pictures from your PC, it also supports RSS to pull in images from the Web from places such as Flickr. Not only that, it also searches for PCs to connect to all by itself, pulling in pictures stored in Windows Media Player 11. Not sure how automatic this process is, but it could certainly lead to some entertaining pictures being displayed if your picture frame happens to find your neighbour’s unsecure Wi-Fi connection, and starts pulling in pictures from his classic collection of vintage pr0n! More details of the Samsung SPH-72P Wi-Fi picture frame after the jump. The Samsung SPH-72P sounds like a cracking device for those with a lot of money to spare for mantelpiece decoration. The screen itself is 7 inches, with 800 x 480 resolution. A bigger 12 inch version is due later in the year. The SPH-72P release date is unclear at the moment, but is expected to be later in the year, priced around $300. Panasonic MW-20 adds a new twist to the photo frame – music!